The signals were clear: indoor shades and bootcut denim. The Sleeves had arrived to rock! Playing songs from their forthcoming album, the four-piece kicked off Underground 118. “This is the most British band I’ve ever seen,” remarked a bystander during the show. Indeed, the band’s sound is a melting pot of Britrock influences from the past 30 years, paying tribute to the great traditions of guitar pop. After the Kasabian vocals and Richard Hawley vibe of opener The Menace, the amps were turned up for the punk Rumble (Inside My Head), with singer Keith Goodman’s shouty “I’m on a knife edge” lyrics. The Horror recalled Blur with its There’s No Other Way intro, while the influences of The Enemy, Oasis, Stone Roses and Travis could all be heard amid the bolshy riffing and ballsy singing. Girl began with a cool drums-and- bass solo before two revving guitars joined in. The song allowed drummer Matt Coleman to shine – his light touch delivering a big rock sound as the song exploded with bluesy, jagged riffs. Pete Gordon’s clever guitarwork on Never Let Me Go was Parklife meets Shoot The Runner, while joyful, singalong closer Dance Floor finally got the crowd moving its catchy, room-filling chorus. The Sleeves are unlikely to entrance the hipster crowd, but they delivered a set full of feel-good rock ‘n’ roll cheer that will keep them on top of the list of the city’s favourite live acts. It’s always so hard for me to review The Sleeves because I like to think that they are my mates! Except Keith, who is my Uncle Keith and my music career advisor. One can’t befriend the staff. I’m always going to be biased, but I do legitimately think that they are a good honest rock’n’roll band who write songs from the layman’s heart. I asked Philip from the band ‘Lone Star Radio’, who was watching The Sleeves with me, what he thought. He accurately answered “They have that Brit-Rock vibe with the good songs going on, I like them … I BELIEVE them” Couldn’t have said it better myself. The Sleeves are another band who have grown a lot, I have seen them in quite a few incarnations, and I feel like they have found a good place with this current line up and role responsibility. Pete, the band’s new lead guitarist wears sunglasses on stage. If you know me well, you know I f****** hate guitarists who wear sunnies on stage, IF… IF…they can’t back it up. My hat’s off to Pete, he played with attitude, flair and had great lead guitar work, I forgot that I initially had beef with him and became an instant fan. His riffs and solos bring that little bit more of an edge to The Sleeves that I previously think was missing. This is saying a lot as I was a big fan of previous axe man Bee. I also have decided that Uncle Keith is the right front man for the band, and that they have a great rhythm section with bassist AG possibly being one of the most fun band members to watch in HK. The Sleeves recently released their debut CD. You should definitely pick it up. Now. Bee It’s always great to see a packed Hong Kong bar, filled with enthusiastic music fans, rocking out to Hong Kong music. Keith It was a great atmosphere and a great night. The sound system at The Cavern was fantastic and everyone was getting into the music. 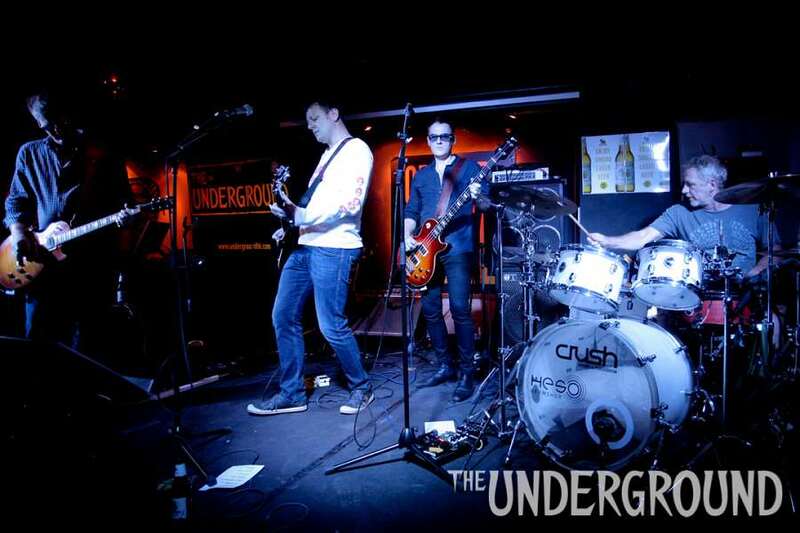 In fact it was the perfect way to celebrate the CD and our first year with The Underground. Here’s to many more ! Now, despite there not being their usual hoi polloi, it would be an understatement to say that they really got the crowd going. Certainly, the singer’s willingness to don the undies (which had been through a torrid time, being buffeted around constantly on and off stage), and dancing in the crowd to face the band, and get the audience singing along, helped their cause. By the 3rd song’s end Special K was persuaded to take off his t-shirt, revealing the “skirt” to be a black dress (not exactly Audrey Hepburn, but not far from it either). There were jungle beats scattered around in some songs, with some remarkably versatile moods to each song reminiscent of Mink DeVille at their peak. Stockholm in particular, had an anthemic chorus (with shades of The Ramones’ Today Your Love, Tomorrow the World.) We were treated to Space Dogs, apparently written the previous night, followed by the closer, Mirror, sung by their (very good indeed) second voice, and all too soon, it was over.